The dishes have been reviewed and the delicious, healthy meals have been considered. The top finalists have been narrowed down to one all-star dish. Here's the winner of the #FitMenCookoff! It's time to lay down the spatulas, turn off the oven, unplug the food processor, and turn off the dishwasher. That's right: It's time to unveil the winning dish of the #FitMenCookoff. Among all the delicious stuffed meats, handmade tostadas, munch-worthy fritters, easy-to-eat rolls, and tangy dressings, one dish stood apart. 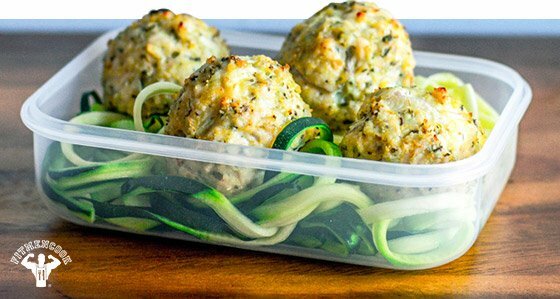 The winner of the challenge is Savory Chicken Meatballs with Zucchini Pasta and Marinara Sauce, and a fully-loaded twice-baked sweet potato by Joseph, aka @cookeatlift! I was drawn to the simplicity of this stellar dish. It's healthy fare that turns a muscle-building staple on its head without being overly complicated. The chicken breast meatballs are a great alternative to a lone piece of dry chicken breast, and the twice-baked potato with apples provides a sweet take on a complex carb. This meal is also extremely versatile and can be easily adjusted for both low- and high-calories diets. Going low-carb? Ditch the potato. Looking to bulk up and add on some lean muscle mass? Go all-out and enjoy! Boom. I've recreated Joseph's meal below but made it "meal-prep ready" with a few tweaks to save you some time in the kitchen! Congrats, Joseph, and to all of you that submitted amazing recipes. Always remember to adjust portions and servings to support your fitness goals. 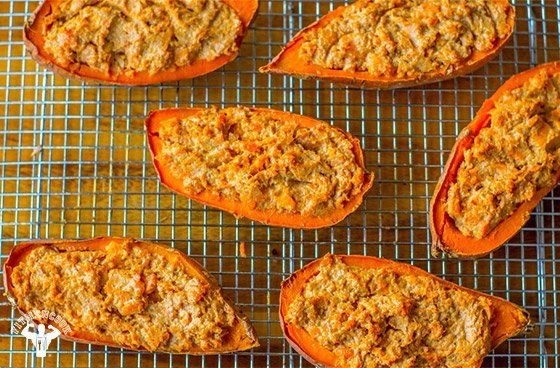 This recipe will make 6 stuffed sweet potato halves at about 180 g sweet potato per half.